A landslide has caused the derailment of a passenger train in south-east China, with at least 19 people killed and 71 injured. The train crashed into dirt and debris blocking the tracks in a mountainous area of Jiangxi province at 0210 (1810 GMT), the railway ministry said. It had been making its way from Shanghai to the tourist area of Guilin. Jiangxi has been hit by heavy rains in recent days, causing landslides and flooding low-lying farms. An investigation has been opened into the crash and the provincial governor, Wu Xinxiong, was reportedly at the scene to oversee the rescue operations. 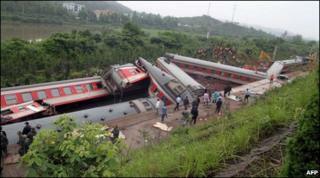 The locomotive and eight of the 17 carriages appear to have overturned in the crash near the city of Fuzhou. Some 2,000 rescuers including fire-fighters, police and soldiers worked through the night to free survivors and extract bodies, using heavy cutting equipment to reach them, China's state news agency Xinhua reports. Officials did not know how many passengers were on board at the time of the derailment. More than 280 passengers were evacuated from the train and 53 had been freed from the wreckage as of 0900 local time on Sunday. A railway police officer told Xinhua that each carriage had had 118 seats and four of them had been "severely damaged". A survivor was quoted by the agency as saying his carriage had been less than half full. President Hu Jintao urged the railway authorities to re-open the lines as soon as possible, and they are expected to be functioning again early on Monday. About 8,000 cu m (10,460 cu yds) of mud and rock have been cleared from the tracks. More than than 40,000 residents in the area have been evacuated as a result of the flooding.